The National Security Act of 1947, as amended; the Intelligence Reform and Terrorism Prevention Act of 2004; Executive Order (EO) 12958; as amended, Classified National Security Information; EO 12333, as amended. United States Intelligence Activities; EO 13355, Strengthened Management of the Intelligence Community (IC); and other applicable provisions of law. President, or designated jointly by the Director of National Intelligence (DNI) and the head of the department or agency concerned, as an element of the IC. Unauthorized” disclosures of classified information, including media leaks, may compromise sources and methods and pose a threat to national security. This directive establishes the DNl’s policy to deter, report. and investigate unauthorized disclosures and to take appropriate protective and corrective action. 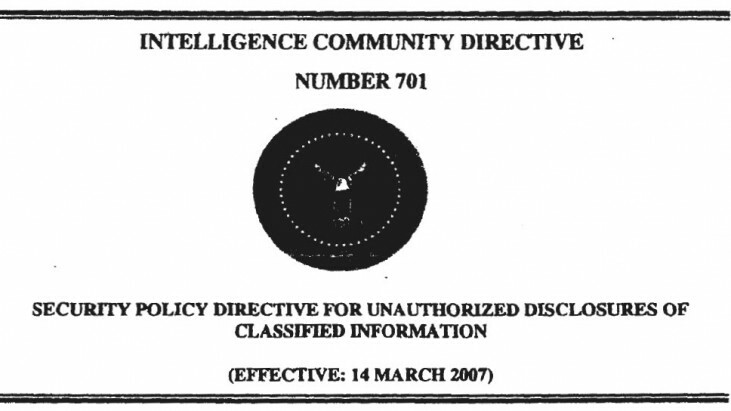 This JC directive (lCD) rescinds Director of Central Intelligence Directive 6/8, dated 9 December 2002. Notification to the DNI does not affect the authorities and responsibilities of Senior Officials of the Intelligence Community (SOIC) to report to the Attorney General possible violations of federal crimina] laws under EO 12333, as amended.